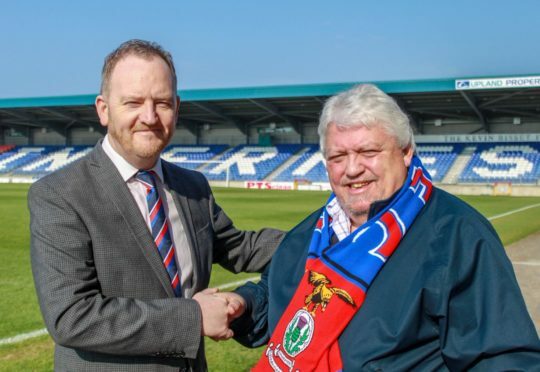 New Caley Thistle chief executive Scot Gardiner with chairman Graham Rae. Caley Thistle have appointed Scot Gardiner as the club’s new chief executive officer. Scot Gardiner has taken up the post ahead of Saturday’s William Hill Scottish Cup semi-final at Hampden against Hearts, one of his former clubs. Gardiner was chief operating officer of Hearts between July 2014 and August 2017. He has held a number of senior management roles in football over the last 20 years, having previously worked as Dundee’s chief executive officer, Tottenham’s commercial manager and commercial sales manager at Rangers. Gardiner said: “I like what I have seen on the park in terms of the style of football being encouraged by the manager and the hard work of the board of directors to create a more sustainable business model. Their commitment to promoting a youth development system is also highly commendable. Caley Thistle chairman Graham Rae said: “Scot has attended a number of our games this season and I have always been impressed with his knowledge of the game, both on and off the park. “He has a wealth of experience in the football and business world and is highly regarded in the game.